More than 150 people in Illinois have been sickened by the fungal disease, known as Candida auris. That total represents about a fourth of all the cases nationally and is second only to New York. Nearly every Illinois case has been in Chicago or its surrounding counties; three cases were reported near St. Louis. If you’re in a hospital like Memorial Medical Center in Springfield, for example, the likelihood you’ll become infected with the fungus is extremely rare. The vast majority of cases have been found in “post-acute and long-term care facilities, especially long-term acute care hospitals and skilled nursing facilities that take care of patients on ventilators,” according to the Illinois Department of Public Health. These facilities take care of the most critically ill patients, whose weakened immune systems mean they’re already at risk for infection. “There’s no need for healthy people to worry about this fungus,” said Gina Carnduff, system director of infection prevention at Memorial Medical Center. While the fungus is often resistant to drug treatment, the Chicago Tribune reported that the fungus “is not widely infecting healthy people” and most cases in Illinois have been treatable. Patients who have the fungus are frequently sick from other medical conditions or have compromised immune systems. Even if the fungus were to become common in local hospitals, Memorial Health System’s four hospitals already have stringent infection control practices in place to reduce the transmission of healthcare-associated infections, Carnduff said. These include an ultraviolet bacteria-killing robot and bleach-based disinfectants. Further, patients with antibiotic-resistant infections are placed into isolation in accordance with guidelines from the Centers for Disease Control and Prevention and the Illinois Department of Public Health. The fungus doesn’t become a health issue for patients until it invades their blood, heart or brain. You can even have the fungus on your body without developing an infection or any symptoms, Illinois health officials said. That’s why it’s always important to wash your hands when you visit the hospital, Carnduff said. It’s also a good practice in general. 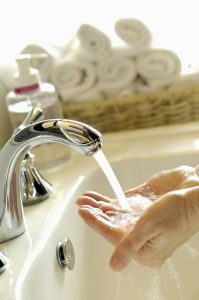 Regular hand-washing is one of the best ways to remove germs, avoid getting sick and prevent the spread of germs to others, the Centers for Disease Control and Prevention said.